The nature of my practice leads to some interesting challenges. One of which i faced this morning. Ally McGinn (2017) Painting [Working Title]. Paint and studio dust. size varies. ....no longer exists. It was swept up and thrown away by a currently unidentified person. The question here becomes....can I really be annoyed by this? Is the act a comment on the work? It is certainly an almot humerous observation to it. In response, replication and failure, this is the remainder. An Italian art movement, prominent in the late 60’s and 70’s that reaffirmed that anything could and should be used as art. Characterised by the subversion of process and non-traditional everyday materials. Translated as ‘poor art,’ (Lumley, 2004) the term describes a step away from traditional materials into those considered ‘poor’ including soil, rubbish, and twigs. (Lumley, 2004) The use of materials considered traditionally non-art disrupts the commercial system of the art market found in the contemporary gallery. Jannis Kounellis (1968) Untitled. Wood and wool. The primary period of production for Arte Povera was between 1967 and 1972. (Christov-Bakargiev, 2005) It has been called Italy’s contribution to conceptual art. (Christov-Bakargiev, 2005) The influence of Arte Povera has continued to current trends, I can certainly say I am following a similar thread. In this way, Arte Povera artworks are marked by evidence of their own making. Works that speak about materials in this way distort ideas about traditional value in art. Many changed appearance when shown in different galleries or would need to be remade each time. (Christov-Bakargiev, 2005) These works became interlinked with their immediate surroundings, drawing the viewers attention to the architecture of the gallery and the space of the work. Changing physical states typify the work, (Christov-Bakargiev, 2005) not trying to represent anything other than themselves and their transformations. The interrogation of what art is, through a challenge of its boundaries, is still ongoing in contemporary explorations. Questioning the nature of art can be seen as the foundation of all contemporary art. Michelangelo Pistoletto (1967, 1974) Venus of the Rags. Marble and textiles. 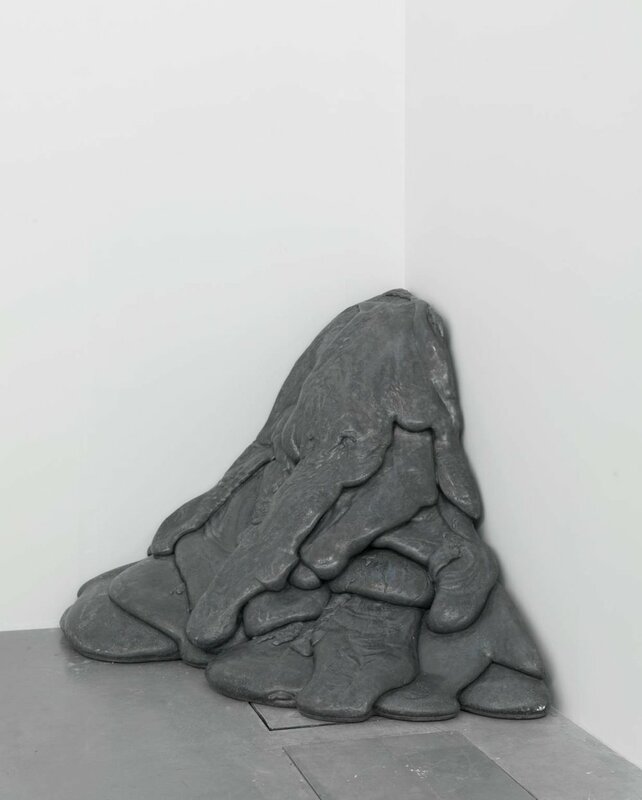 Linda Benglis ( 1969, cast 1975) Quartered Meteor. Lead and steel on steel base. These artists continued to develop the use of the everyday, into a challenging form that questioned our assumptions and preconceptions about these materials. The use of ‘poor’ or unwanted materials the artworks questions, transforms and extends their purpose. Christov-Bakargiev, C. ed. (2005) Arte Povera. London : Phaidon. Lumley, R. (2004) Arte Povera. London : Tate Publishing. Walker, P. (2009) ‘Rich vein of poor art - Tate Modern revisits influence of Arte Povera’, ‘The Guardian’, [Online] Avaialible from: https://www.theguardian.com/artanddesign/2009/may/18/tate-modern-sixties-arte-povera [Accessed 03.12.17]. Kim Yong-Ik (2017) I Believe My Works Are Still Valid. [Exhibition shot]. Spike Island, Bristol. 26.11.17. Kim Yong-Ik (2017) I Believe My Works Are Still Valid. [Exhibition]. Spike Island, Bristol. 30 September - 17 December 2017. This exhibition was recommended to me by fellow students on the MA as they began to get to know my work. I went with my daughter, the perspective of a 6-year-old is extremely interesting, and it quickly overtook Jasper Johns as my favourite exhibition experience this year. Kim Yong-Ik is a Korean artist born in 1947 in Seoul. This is his first solo show in Europe and was preceded by an exhibition in Korea. He is known for his questioning nature and playful execution of works. Kim has remained firmly detached from any set art movement, a distance that allows him to subvert and challenge the practices of art institutions. This description fits the underlying nature of the works in this show. A major turning point for Kim was the repression in his country in the 1980’s. At a time when he was writing a thesis about Duchamp, he was invited to take part in a show, the ‘Young Artists Biennial’. His works, which were paintings, were boxed, shipped and shown in the exhibition, still in their boxes. The boxes were stacked as a sculpture in the exhibition. This work serves as a response to the political upheaval and Modernist painting. Kim is known for his uncertainty in his place in the art world, and the ‘role art should play in society’. His continuing practice pushed painting into sculpture, often working with the space of display within the work. A key piece in the exhibition, for me, was made in this time. Near an access door to the gallery at Spike Island, a fantastic placement for this work, is a pile of unwanted works, and packaging materials. The pile is left haphazardly and the viewer is left unsure whether the works are simply waiting to be cleared away. Due to the nature of the gallery, without titles on the walls, the only clue that this an artwork is found in the accompanying catalogue and exhibition guide. This ambiguous work is utterly brilliant, it immediately forces the viewer to ask a question. Kim said about the work that “it is also a metaphor for many of my parent’s generation who crossed the line of life and death based on their decision to be left wing or right wing.” A deeply personal and political message that the artist has found expression with through the work. Kim's works interact with the space around them without becoming totally site-specific. They fit the space, without being reliant on it. Something I am attempting to achieve in my works. The title of the exhibition comes from writing on one of the works in the show. Writing is a key element of Kim’s practice. The stack of boxed paintings has a new addition for this exhibition. He has written ‘Spike Island’ and the date one each crate. The single most exciting feature of this exhibition, seen here as a whole, is the writing on the walls Kim has made to explain things about the work. These small additions are a site specific interaction with the presentation of an existing artwork. They are small, and light, and could easily be missed. Many require the viewer to sit on the floor to see them. I took photos of a few, and they are brilliant additions to the work, and show the performative aspect of practice. Kim returns to many artworks, seeing the process as ongoing, and enjoys allowing time and chance to affect the works. The final section of the exhibition, depending on how you move around the space, features recent works. These sit between painting and sculpture, paintings within sculptures. Kim has encased paintings inside coffin-like cases. Known as the ‘Coffin’ series these works are inscribed with various writings. An accompanying paper translates these for the viewer. Many of the texts describe or somehow comment on the work, sometimes directly but often romantically or poetically. Some are simply documentary. The inclusion of these elements of text contextualises the work, within the work. This exhibition has been extremely influential, and I imagine it will only become more influential as I continue to review it, and hopefully visit once more before it closes. The placement of this piece is intentionally challenging. Spike Island is a large open space, with a central section. This piece is against one of the walls of the central section, challenging the viewers perception of the narrative action of gallery space. This combination of pieces transcends time, the element on the wall is a recent execution of an older idea. The repetition of marks and form brings the space into the work, while the different materials make us question the materials themselves. This exhibition has quickly become one of the most influential I have seen this year. The works are a combination of Kim's personal subject matter (including circles) and a questioning of art that is conceptually engaging. The works are carefully arranged, and full of surprises. His works and the context behind them have made me question, in the best possible way, my own practice and influences. It is really through this exhibition, and a subsequent reading of the accompanying material, that I have realised the links of my work to capitalism. A link later reiterated with the text The Experiential Turn. I havent written as much as I normally might about this exhibition, the experience shows more in the shift in practice that has come from the combination of this exhibition, studio research and contextual research in the past few weeks. I need to go back to the exhibition before it closes. I need another look and more time to think about these intricate implications.